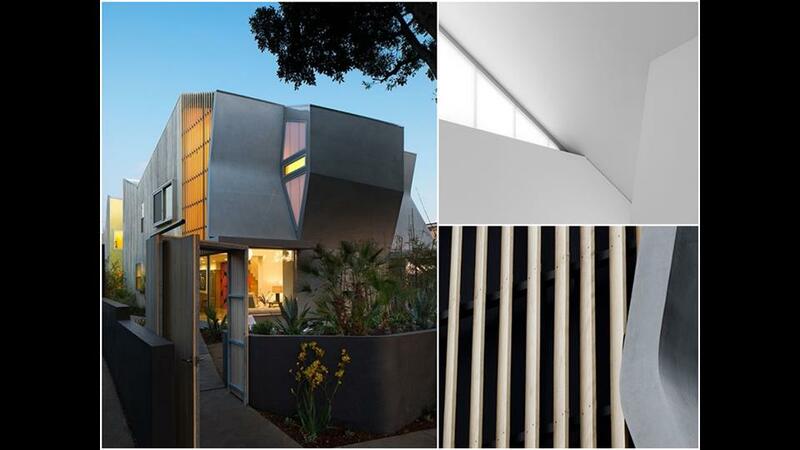 This hyper-modern and environmentally conscious Santa Monica home, designed by Fellow of the American Institute of Architects (FAIA)-award winning architect Kevin Daly has all the elements necessary for eco-conscious buyers—from a drought-resistant landscape design and electric car garage, to a solar-thermal heating and passive cooling systems. Completed this year, the house is a pure expression of Mr. Daly’s environmentally minded creative vision. It sits on the east side of a lot that is shared with Mr. Daly’s own home, in a modern re-imagining of the traditional “semi-detached” set up, which was conceived as an innovative solution to the tight Santa Monica lots that tend to be very long and narrow. We didn’t want to have a back house and a front house,” Mr. Daly said, so he designed a unique S-shaped plan that would allow the two homes to sit “nestled together” alongside each other, with a courtyard in the center that accommodates large side windows. Engineered and built as two very separate units, a two-story concrete wall down the center of each allows for complete acoustic privacy. The 2,500-square-foot home has three bedrooms and three bathrooms. The house is gated for security. It’s also “solar ready” —with its inside and outside radiant flooring, heating, and hot water being powered by solar thermal energy—while its motorized clerestory windows are designed to allow for passive cooling. The home’s two-car garage is equipped with 220 volts to charge any electric vehicle, and its low water landscaping system operates via a drip irrigation with rain sensors, while also making the garden drought-tolerant. It is also very close to the thriving cultural center of Venice, as well as East of Lincoln (known colloquially as “The Link”), which is currently attracting many young families. The home lies a stone’s throw from a quickly gentrifying mecca of yoga studios, coffee houses, and artisan restaurants.